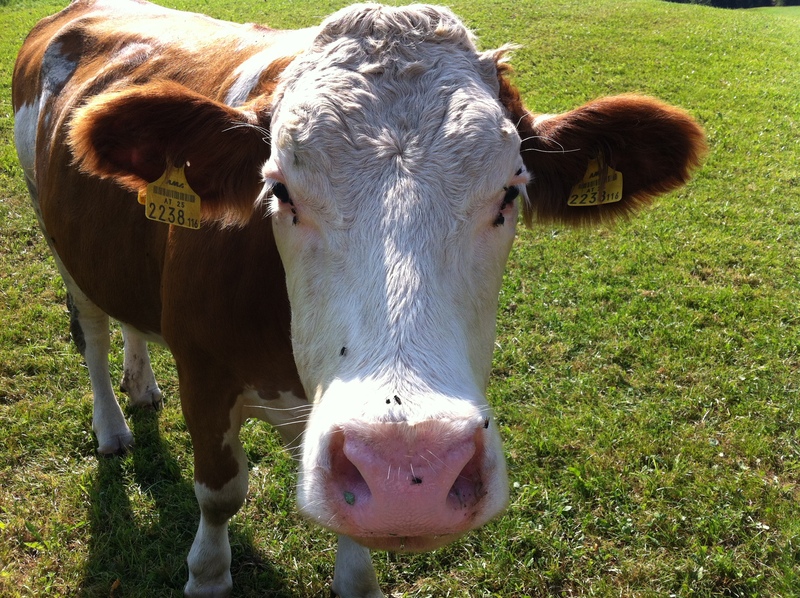 The Carinthian Blond, a rare breed of beef cattle found in Austria, is nearly extinct! It would truly be a tragedy if these docile, hard working, valuable animals were lost. Carinthian Blond Cattle have been used as draft animals for centuries and are fairly easy to handle as a result. They are docile and good-natured, and have been described as willing and hard workers. Carinthian Blond Cattle are extremely hardy, and well adapted to mountain environments. They are low maintenance and may be turned out into mountain pastures in the summer to graze independently. Mature Carinthian Blond bulls stand from 138 to 145 centimeters at the shoulders, and cows are about ten centimeters shorter. Generally, bulls weigh about 825 kilograms and females weigh from 500 to 600 kilograms. They are quite powerfully built and have good feet and legs. The hooves and the horns are both the color of wax, and may have dark tips or lines. Carinthian Blond Cattle are blond, as the name would imply, ranging in color from almost white to a light silvery gray. Although the eyelids and muzzles of Carinthian Blond Cattle may have blue or black pigmentation, usually they are pinkish or flesh colored. Their meat is of high quality and the milk has good fat and protein contents. Carinthian Blond Cattle originated in Carinthia as a mix of local gray or golden cattle and southern German Red Spotted breeds. In the 1700’s, a link between Hungarian steppe breeds and more modern mountain breeds, these cattle spread into the areas of Carinthia and Stytia. The Meierhofen estate became an important breeding center. Cross breeding with Franconian and Spotted Cattle occurred in the early 1900’s, when Carinthian Blond Cattle made up 37 percent of all Austrian cattle! After World War II, the breed became virtually unknown as other breeds began to replace it. A herd book was established in 1982 in an attempt to save the Carinthian Blond, although today it is nearly extinct. Carinthian Blond Cattle do best under management systems where they are turned out into mountain pastureland in the summer and stabled in the winter. They are fairly stationary cattle and do best when not driven long distances. Carinthian Blond Cattle are good milkers. They are about average in calf mortality rates and calving intervals, along with calving ease. They are extremely fertile and robust, and their strong calves fatten quickly. Estimates say there are less than 100 animals remaining alive, so responsible breeding is important.